Open it and record your speech. Click on the link below if video does not load. Go to the website, Podbean and sign up for a free account. Once you've signed up, Podbean may require you to login. From the green tabs at the top, chose "Publish." Click on the green, upload button to begin. You'll have to wait just a bit for the upload to complete. See, mine is 87% complete. Podbean begins the uploading process now. You're almost finished. 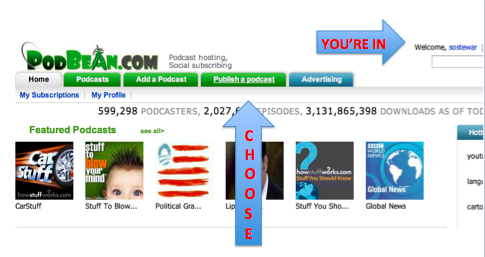 You can click on the podcast file to get the website where you podcast lives. Use this web address to send to your teacher.